This beautiful S-Bar mothers birthstone ring can be customized to fit your desires. Gift her This Ultimate S-Bar Mother Birthstone Ring, Mom Birthstone Ring, Mom Ring, Nana Ring, to show her that she is special and loved! The ring was beautiful and came even more quickly than expected. We had measured wrong and the company was very accommodating and prompt about resizing it. I highly recommend it. Good value and good customer service. 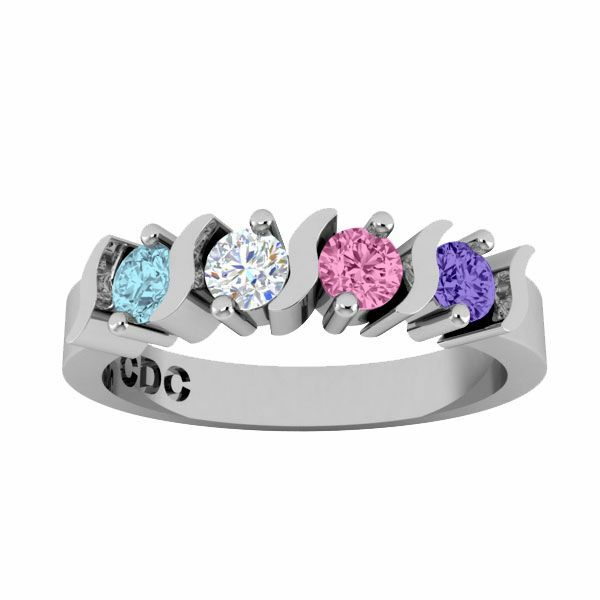 I ordered the sterling silver ring with my 2 children's birthstones and it's very pretty and delicate. They contacted me by email right away to specify the stones in the ring and I received it sooner than I thought I would. The quality is good for the price and overall I'm very happy with it! It's nice if you're looking for something simple and not too flashy. I'd be happy to share a photo of it, if I can figure out how to do that. Item arrived before it was supposed to which is awesome! Ring itself is flawless, stones are beautiful and cut to where the light reflects off them beautifully. My wife says that she really likes her new Mothers ring. Ring was perfect. Ordered the ring and the company emailed me almost immediately. I told them the stones we wanted in them and it was shipped very quickly. It beat the predicted date for arrival date so that made me happy as well. My wife loves her ring and it seems to be durable and should last awhile. Great product great value! I called and spoke with the retailer to go over the order, he was great to work with. The only error was not ordering the right ring size but this was my fault as the jeweler provided exactly what I ordered. I would buy from them again. Very nice to work with, nice ring wife loved it. It was exactly what we ordered, came on time. I ordered this for my wife and the company was amazing. Contacted me via email almost instantly and had the ring designed to my specifications and shipped extremely fast. My mom says she loved it and it arrived very quickly!